I'm tempted to buy Robby's English Harmony! Even if my financial situation isn't glorious, I would like to make the effort. I read several times all I have to know about the system but on the other hand I wouldn't take the risk to spend money for something that will not help me. He says that if one can't speak fluently after studying this way, he'll give the money back but I would never dare to do that! I'm easily influenced concerning English learning and I know that you told me that my knowledge isn't high enough. Nonetheless, he gives me hope. Please tell me if you know someone who tried it. What's the result? Is his method really as efficient as he promises? Is his method boring or motivating? Comments for Should I buy English Harmony? Your remarks about the course are precious and useful for potential buyers. Thanx a lot! But you did't take trouble or desire to mention, however, that the product focuses on AE, rather than BE. It sounds all the more strange taking into account the fact that the author lives in Ireland rather than, say, in Los-Angeles. Thank you very much for taking the time to comment. You raise a very good point that people should know. English Harmony does focus on American English (AE) rather than British English (BE). Robby lives in Ireland as well but I don't believe that where he lives should directly influence the focus of his fluency course. Speaking of aspects that I have not mentioned, I thought I should highlight the confidence mentor more. The course is separated into three parts and my favorite is the confidence mentor. Robby speaks about it in an interview that I did with him. This section contains "confidence building meditation lessons which deal with different anxieties like the fear of making mistakes and feeling inferior to other English speakers. Thanks for the English Harmony Info! Hi Diana, It's too bad that your husband and your brother-in-law haven't got an opinion yet about the course. I guess, that they are more able to judge than any native speaker except teachers like you. Your experience with students allows you to have an idea as well. Finally I realize that my question was quite ridiculous. I always repeat that everyone has to try out what works for him. What's boring for me may be excellent for another person. Yesterday, I was unhappy about the fact that even if I know that it's not really a method I need, I never lose hope to find something new. I'm not the kind of person who needs to speak English but there is always this temptation! Aren't I looking for a "miraculous method" knowing perfectly that it doesn't exist? It's me who is responsible for the result. It depends on my efforts. Will I have the guts to improve? Anyway, all you're telling me about the different DVD's and the ebook clears things up for me. The temptation of your free audio book helps me to make my decision! Now, I can't resist anymore. I'm starting to read out loud as often as possible but there are a lot of English words which are written exactly as in French or German and I never know how to pronounce them correctly. As you know I like listening to your voice. Inicially, I asked myself if you'd have the time to record the book. Your offer is very generous! I made my decision and it's clear that I have nothing to lose by trying it out. The own risk is that my English becomes better even if it's not as much as I expect. It will not become worse! Nonetheless, let me know the reactions of your husband and brother-in-law when they have tested the English Harmony system! Thanks again for spending your precious time. I liked the eBook so much that I recorded it! In my previous comment I mentioned how much I loved the English Harmony eBook. It is so great, that I recorded myself reading it and I am offering that audio MP3 as a free gift to those who buy English Harmony via my site. I say go for it! 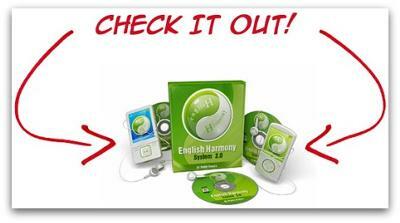 Try English Harmony for yourself! Thanks for contacting me. Here is what I think about English Harmony. I received a copy of the course to review myself. So yes, I have watched the DVDs and interacted with the course. (Please know that I always tell the truth when it comes to products & materials. I only recommend something that will help you and other visitors). Robby's eBook is amazing. You will LOVE it. It is about 60 pages and is written like Robbie is speaking. I think that you will really enjoy the confidence module DVD. It helps improve your beliefs about learning English. It does this by creating a relaxing environment (like meditation) and exposing you to positive affirmations (positive statements about English fluency). It only takes 5-10 minutes to do and all you have to do is press play. Now let's talk about the other two modules. English Harmony is based on the concept of repeating word combinations or chunks. You are presented with word combinations orally, you repeat them and then you are tested by using them in context. Could the course be better? Like most things, there is always room for improvement. In the case of English Harmony I think that the course could be better if it had a video of Robbie saying the word combinations rather than a digital animation of Robby. I mentioned this to Robby and he explained that using a digital Robby, dramatically reduced the price of the course. This is understandable. You also asked about motivation Bettina. For me, the eBook is really motivational. If you apply the content of his eBook to your English and study habits, I know that you will improve a great deal. As for DVD 1 and 3, they might be a bit high for a motivated beginner BUT that would force you to improve more. With your positive attitude I am sure that you could make the course work. Remember that you have to use the course on your computer (a PC because English Harmony does not currently work on Mac or Apple commuters) and you have to have an Internet connection to use it. Still not 100% sure that you should get the course? Like Robby says, try it for 30 days and if you don't like it, just ask for a refund. This is 100% normal for online products (I provide the same guarantee for my products) and if the course is not for you, just ask for your money back. I really like English Harmony. I like how it focuses on fluency and learning expressions and vocabulary in context. My husband and brother-in-law will be using/testing the course in the future as well and I will let you know what they think about it. If anyone is interested in getting English Harmony (and receiving the audio book as a free gift) just click here.